But it wasn't. Over 24 hours later, I was still thirsty. yikes. thanks for being our guinea pig. I had to start downing water three bites in. Plus the cheese was weird on mine. Not awful, but you're right -- never again. I am very surprised to see you ate one of these. I'm thirst just looking at that. It's such a joke. I mean, really?! How many people approved it before it was released?? Freakin crazy. This is not appetizing, even for me. Thank you for going so we don't have to. hah really??? wow that's some weezer monkey chest hair for ya! 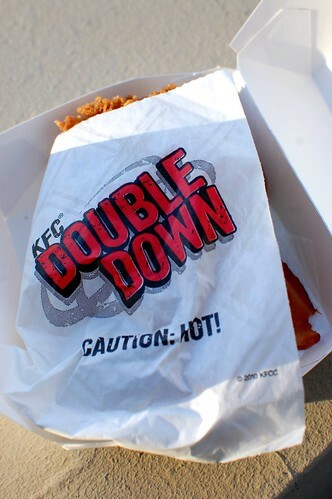 I told my husband you had tweeted something comparing the double down to a -- salt lick, I believe? you already know my take on it. and now i kind of want another one. oh man that thing just scares me. yikes. then WHY dose your photo make it look so good?!?! And now I really want to try one. Yes, I think I am a glutton for punishment. Hahaha... I can't believe you ate it! Did it at least taste good? First bite was really good. The rest suffered from the law of diminishing marginal returns. It was the aftermath that was really bad. Too much salt! you're a brave monkey. I've yet tried, and will not do so either. I would totally try one. With a giant diet coke. 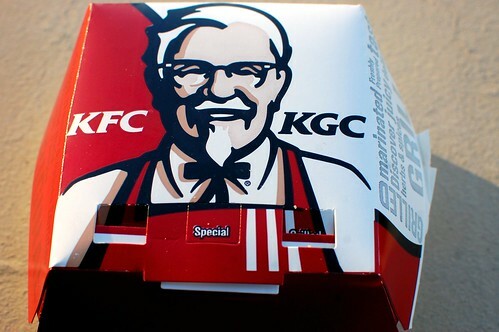 i have never been to a KFC in about 4 yrs. Now this adds to my list of, I don't need to eat this there. 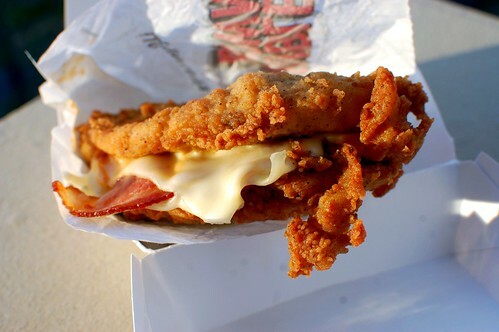 you WOULD eat this you HEFFER!! !